BPM Labs have a reputation for making strong supplements. This is particularly evident, even after reformulations of classic products like The One. Now they have revamped fat burner BPM Labs Annihilate. Curiously though, it will actually run alongside the company’s other fat burner BPM Labs LipoRush. Due to the ban of AMP Citrate or its equivalent Pouchong tea equivalent, BPM Labs have reformulated to fit regulations. It includes a whole heap of stimulants including taurine, caffeine, cacao plant extract (caffeine and theobromine) and synephrine. In addition to these stimulants, there is also African mango (fat burning), green tea extract (fat burning) and naringin (may improve potency of other ingredients). With your very first serve of Annihilate you will experience what BPM is best known for. Annihilate is possibly one of the strongest fat burners currently on the market. It hits hard and fast. Within around 15 minutes, you’ll feel quite a buzz and elevation in mood, even from half a serve. Annihilate is a serious energy and fat burning supplement only recommended for experienced users of supplements. We would even say that Annihilate is the strongest product BPM have put out to date. The Annihilate experience is all thanks to the blend of powerful stimulants, undoubtedly in high doses. Despite the ban of illegal stimulants and old fat burners containing DMAA, Annihilate is pretty much as close as you’ll get but with a reduced likelihood of getting a hard crash. When used properly, combined with a calorie restricted diet and exercise, Annihilate can be a potent weapon against fat. It boosts energy in times when you need it, helps you stay motivated, and assists with increasing metabolism for extra fat burning. Annihilate is not recommended for those sensitive to stimulants. Even for experienced users, we strongly recommend starting at a partial dose and gradually working your way up. 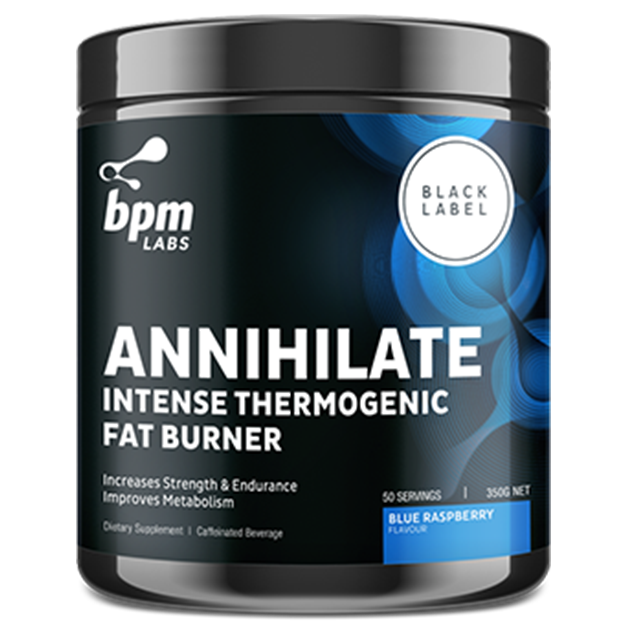 Another curious fat about Annihilate is that its formulation is extremely similar to BPM Labs’ other fat burner, LipoRush. Many of the ingredients are in common, but in a different order, we are not actually sure why the company actually needs two such similar products. It is true that that sensory experience is slightly different between the two (stronger with Annihilate), but we feel the end results would be very similar. Annihilate mixes very easily with water and a shaker cup. There is only a slight amount of frothing, but that does not really take much away from the product. Unfortunately, flavour is definitely not a strong point for Annihilate. It is very bitter as soon as it hits the tongue. Beyond this, the flavouring used is quite pleasant, but it is hard to ignore the bitterness and lingering aftertaste. Annihilate is definitely not something you would drink for fun. Quite possibly one of the strongest fat burners on the market at the moment, BPM Labs Annihilate is a fat burner not for the faint of heart. Packed with strong stimulants, Annihilate is definitely a fat burner for fans of strong stimulants and hard hitting energy.